Several mysteries surround the Kindred Spirit mailbox. No one know who first put it there or who replenishes it with notebooks, pens and even reading glasses. Although I’m a big fan of social media, (I just pinned a new item one of my Pinterest boards), I feel sad when I think of the lost art of letting writing. Somehow, <3 is just not a fulfilling expression of love when compared to a three-page letter extolling your virtues and lips like cherries. 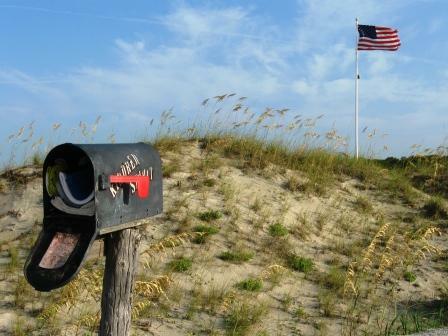 One place where letter writing is still thriving is on Bird Island, North Carolina where people pen their thoughts, dreams, wishes and prayers and leave them in the Kindred Spirit mailbox. Located in the dunes more than a mile from the last public beach access on Sunset Beach, the mailbox still fills up with letters from people who walk there to deposit them, or who sit down on the nearby beach to write. An uninhabited 1,300-acres State Preserve barrier island, Bird Island is connected to Sunset Beach, 35 minutes north of Myrtle Beach. The mailbox and bench suffered a bit from surrounding erosion from Hurricane Irene in 2011 but were relocated by volunteers a few feet back from its original location. For those who can’t make the trip, you can visit the virtual Kindred Spirit Mailbox here. I will be visiting this area in December for the first time! … can’t wait to photograph the beach and write my letter!